The significant remodel was designed to blend seamlessly with the indoors and maximize outdoor entertainment space. 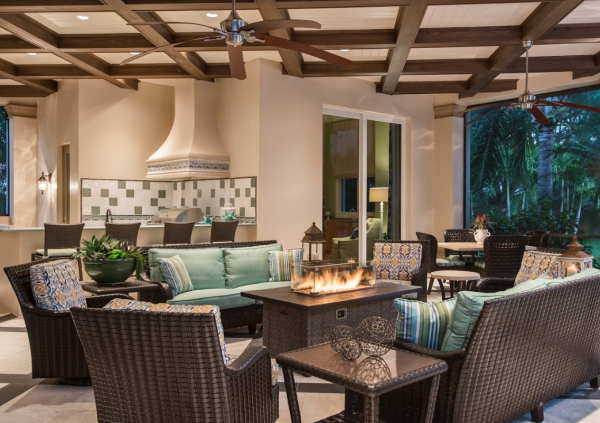 The completed renovation included an outdoor kitchen, multiple seating areas, and several dining spaces with new floor finishes after replacing existing materials. Custom woodwork rebuilt with hand cut cypress beams set into a grid pattern created the depth and new fire features brought extra convenience and comfort to the outdoor space. 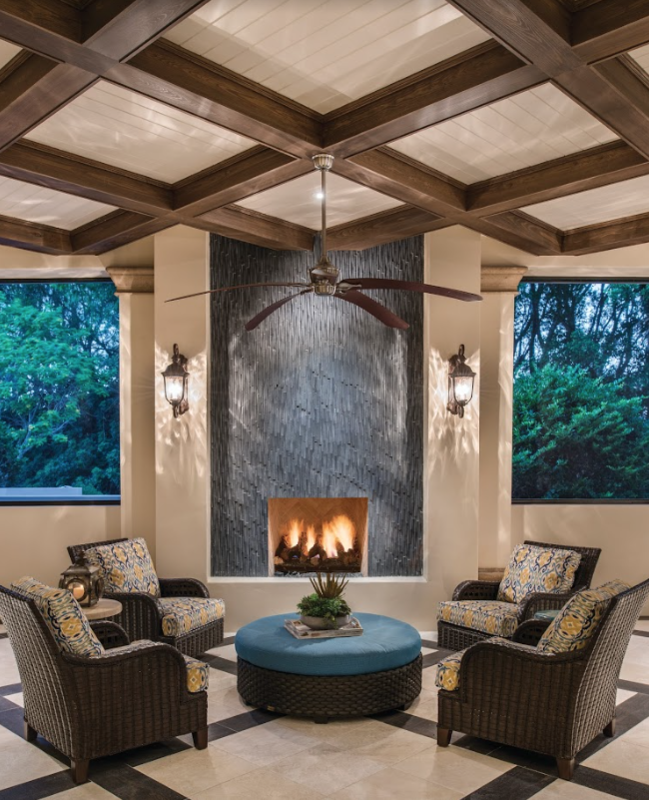 This grid ceiling design is repeated in the finished stone flooring. The space is now optimal for entertainment with ample seating surrounding the fireplace and fire pit, full bar and grill and all new finishes. Elements for relaxation and gathering, dining, and entertaining were also incorporated. Extensive planning was involved to incorporate all of the clients’ desired elements into the footprint of this luxurious space. The estate is located in a high velocity wind zone, so existing truss and engineering needs had to be assessed and reinforced before a new ceiling of cypress beams could be installed. It became necessary to re-pitch the entire outdoor living area to achieve proper drainage. According to Vice President of Harwick Homes, Shane Klepko, “the newly renovated outdoor living space is fully appointed with all of the modern conveniences of the indoors, including internet connectivity, multiple dining spaces, several outdoor cooking surfaces, ample counter space, and both ambient and overhead lighting. Different colors and textures combine to create an exotic design. We’re excited our clients have this brand new outdoor entertaining space to mirror their active lifestyle,” adds Klepko.